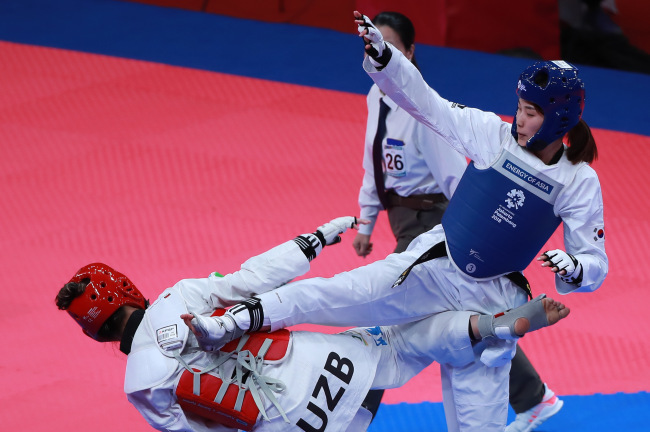 JAKARTA (Yonhap) -- South Korean taekwondo fighter Kim Jan-di won a silver medal in the women's 67-kilogram division at the 18th Asian Games on Monday. Kim lost to Julyana Al Sadeq of Jordan 5-1 in the final to claim an Asiad silver. This was South Korea's third taekwondo "kyorugi" (sparring) medal at Jakarta-Palembang 2018. Earlier, Kim Tae-hun won the men's 54kg, while Ha Min-ah took silver in the women's 53kg. At Jakarta Convention Center Plenary Hall, Kim Jan-di finished the first round scoreless against Al Sadeq. She took a 1-0 lead with one minute left in the second round after landing a punch, but gave up a point on "gam-jeom" (a deduction penalty) seconds later. Al Sadeq, however, took a 2-1 lead after a video review with 45 seconds left in the third round. Kim then allowed Al Sadeq's kick to her head -- giving up three points -- and failed to recover the deficit. Kim had flawless performance in the qualification rounds before the final. The 23-year-old defeated Axaule Erkassimova of Kazakhstan 35-9 in the round of 16 to start her Asian Games. She then demolished Darlene Mae Arpon of the Philippines 29-0 in the quarterfinals. Kim reached the final by beating Nigora Tursunkulova of Uzbekistan 14-4.